Last September Sphero set the bar impossibly high when it comes to BB-8 toys, but at the 2016 New York Toy Fair this weekend, Spin Master might actually have the last word. Not only does its new remote control BB-8 stand an impressive 40 centimetres tall, it’s the first to respond to voice commands. 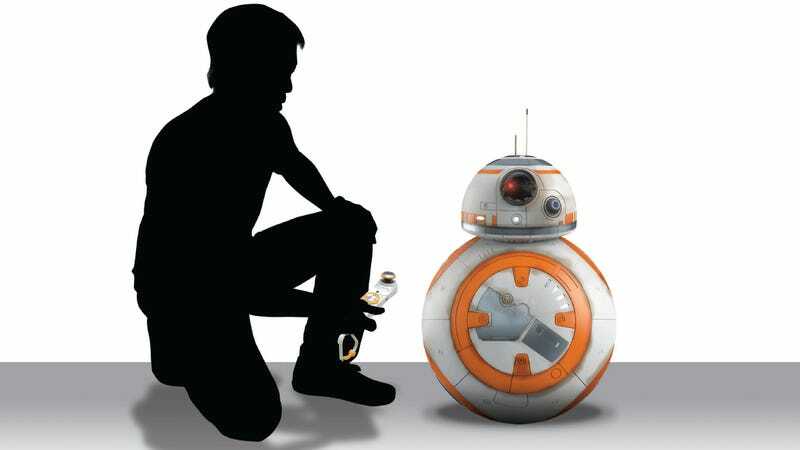 Including the pair of antennas on top, Spin Master’s BB-8 actually comes closer to 48 centimetres tall. So fans of The Force Awakens who were hoping to have their own droid sidekick, but were disappointed with the tiny version that Sphero revealed, might finally find what they’re looking for here. A handheld remote that looks similar to a Nintendo Wiimote, but with an analog joystick on one end, is used to remotely control and steer BB-8 around. But Spin Master realised that Star Wars fans have always wanted to talk to their droids just like Luke, Rey, and Poe do, so its BB-8 is the first to include voice recognition. When you talk to BB-8 it will automatically turn its head to follow your voice, which is a fun interactive element. It will also respond when you say its name, and is smart enough to track your position and roll over to you when you call it, which is just one of several voice commands this BB-8 understands. It even has a Follow Me mode which makes BB-8 automatically roll beside you like a loyal puppy.